Time for "What is this part"
Using this site I have found so much cool info that I print out the items I am going to do to my car. Like today, today I was bypassing the seatbelt interlock switch. After taking down the lower dash cover to access the ignition switch, this silver box relay exposed itself to me. It was note attached to anything. Just seemed to dangle there. 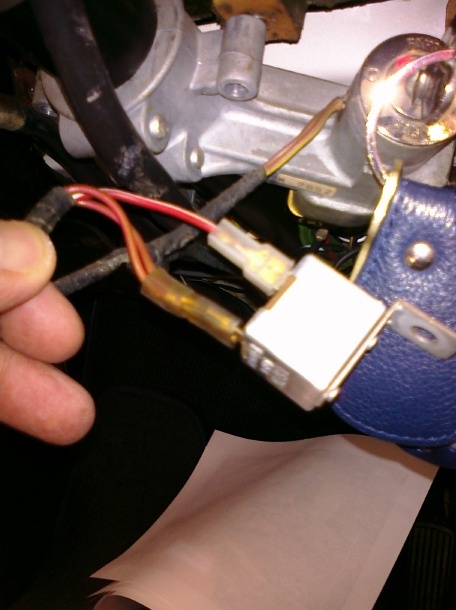 It has two connections, two wires going to the top of the ignition switch outside portion and three going to a round quick disconnect connector further back under the dash. I decided to turn on the ignition to see what would happen if i disconnected it and when I touched the relay it began to emit a subtle constant beep tone. I would think it’s a ‘key in the ignition warning’ or something to that effect. The beep went away when the key was returned to the off position. So what do you think? Am I right? I am going to disconnect this and throw it into the parts bin. Since I have owned this 02, it has never given me a warning beep before. Should be OK? That is the relay for the flux capacitor. Actually the key buzzer relay. Wont' affect a thing to disconnect. But if it is not working, just means your door plunger switch has a bad contact or not tied into the buzzer circuit. I used that post for the seatbelt switch. Excellent Info! It was when I removed the lower dash covers to begin the work. Thats when I found this relay. It has now been removed. The door pin switch did activate the beep sound. I guess all this time it needed to be handled to get working again. Hmmm, that didnt sound right.